Diatomaceous earth consists of the fossilized microscopic exoskeletons of diatoms, single-celled marine plants. It is mined from dried or underwater lake and sea beds. Different grades of diatomaceous earth are used for different purposes; some are altered, such as the diatomaceous earth for pool filters. Only food-grade diatomaceous earth should be taken internally by humans or animals. Diatomaceous earth contains a variety of trace minerals, including silica, magnesium, calcium, sodium and iron. EarthworksHealth says that your body has more than 7 g of silica, which is more than any other trace mineral. Silica is necessary for other minerals to be properly absorbed by your body, and it aids in other body processes as well. According to Vitale Therapeutics, diatomaceous earth is used to remove toxins and heavy metals such as lead from the body. It passes inertly through your digestive tract and carries away mercury, lead, pesticide residues and other toxins. It can also absorb some drugs, so it should be used with caution if you take medication regularly. Consult with your physician before using diatomaceous earth. The fossilized exoskeletons that make up diatomaceous earth have razor-sharp edges. They do not affect the human digestive tract, but they do cause physical damage to any parasites that may be present. When used as part of a detox cleanse, diatomaceous earth is said to help rid the body of parasites while it absorbs and removes toxins and provides trace minerals. These actions can all help boost the immune system, according to DiatomiteCanada. If you are interested in using diatomaceous earth, speak with your health-care provider first. Taking diatomaceous earth can help your body regulate cholesterol levels. A 1998 study by H. Wachter and colleagues at the University of Innsbruck, Austria, published in the "European Journal of Medical Research," monitored the serum lipid concentrations of 19 subjects, ages 35 to 67, over 12 weeks. The study subjects took diatomaceous earth three times a day over an eight-week period while their blood cholesterol levels were measured. In each subject, the LDL and triglyceride levels were lowered and the HDL levels increased. 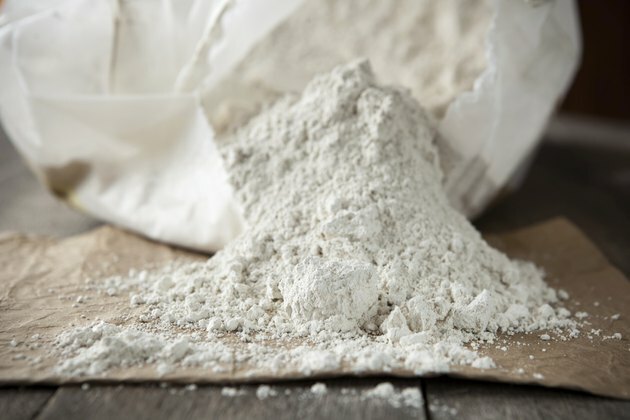 The FDA has rated diatomaceous earth as a "Generally Recognized as Safe," or GRAS, substance, specifically when it is used as part of a food-filtering process. It can be used in grain storage as nontoxic protection against insects that typically infest grain; it can be eaten with the grain or flour, providing trace minerals.